There has been much discussion about the “10x engineer” and whether they exist in this galaxy or are illusive unicorns – creatures of our imagination and fairy tales. People who have been in the industry for a while, especially in high growth and highly successful companies swear they have seen them. Having worked at various such companies, I absolutely believe they exist and that one can find them, hire them, inspire them, develop them, but also take the wind out of their sails if we’re not careful. One of the main objectives of this blog is to look into various avenues to inspire, develop and leverage such people. There is talk about finding them, recognizing them and hiring them, but there’s not much to be found in the way of root cause analysis of what it is that allows someone to become and remain a 10x engineer. What sets them apart and how did they become that way? Understanding that can also help in developing them and keeping them happy where they are – for once you have a unicorn, you certainly want to retain them. During my class on cultural diversity in the classroom, I came upon an idea about why there are so many brilliant minds in Silicon Valley and why also you find only a very small minority of people that were born here and also a disproportionate number of people who had come here from other countries. Consider the founding fathers of the United States that left behind the safety and known world in Europe to risk crossing the ocean into a completely new and unknown environment. Who would do this other than those looking for something better and willing to take risks and overcome challenges to attain something they didn’t have before. So too, often the immigrant who is leaving their home, family, friends and a known culture behind – excited to conquer new challenges in an unknown world to attain something more than what they are willing to leave behind. This could also be the public high-school graduate from a small-town in Arkansas or West Virginia… These are the true entrepreneurs and pioneers that arrive at new ideas and approaches, break new ground and make for great companies. They are the ones that were willing to take risks venturing into the unknown and willing to pay some prices for doing so in hope of finding something better. When I worked in Munich, we used to love hiring engineers from East Germany. They consistently proved to be very eager to succeed in a new and unknown world, and they had often undergone great risk and left behind family and friends to be able to find something better for themselves. Interestingly enough, after the wall came down, the desire to hire people from the east faded – now there were many more people among them that didn’t have to risk anything to get there, hope for all the benefits of communism and jobs that didn’t pay based on achievement and yet still hoped to be compensated at western German rates. The Berlin Wall that had served as the barrier to entry for those faint of heart, much like the ocean to the pioneers, was suddenly gone and coming from East Germany was no longer a valid differentiator to find ambitious people willing to take risks. In finding and hiring people that are more likely to be 10x employees or teammates, it’s key to recognize what sets them apart. If you take the candidate outside their comfort zone with structured questions that allow for various avenues and depths for the interviewer to go, you learn a great deal more than if you probe them for what knowledge they have. The idea is to see how the candidate does when they are taken down a path where their existing knowledge fades and they need to collaborate with the interviewer to first understand the problem and then explore possible solutions. People with fixed mindsets pretty quickly stall or give up when you take them down this path. 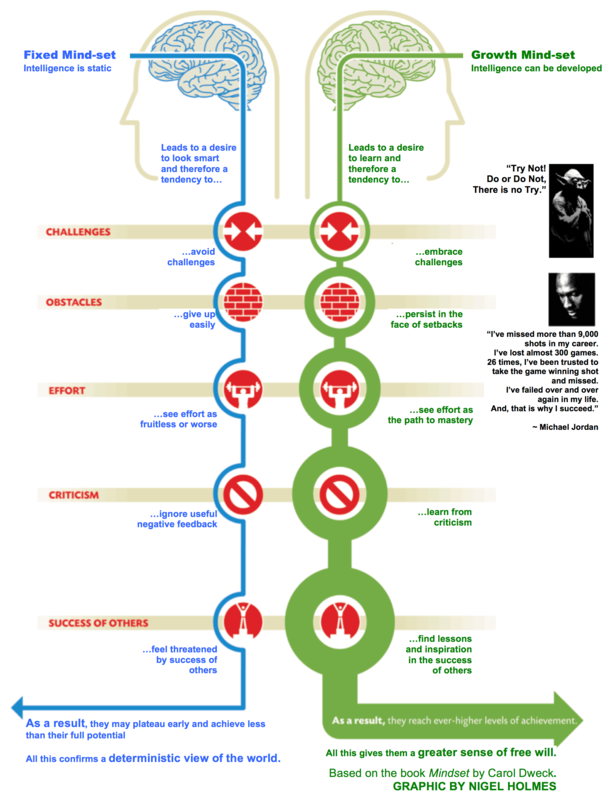 People with a growth mindset will derive energy from a new challenge and will have some skills in grasping the specifics of problems they’ve never seen before along with a willingness to be vulnerable in potentially failing as they explore possible solutions. The ultimate question after a serious of such interview sessions is if they are drained or energized by collaborating and exploring solutions with the interviewer. If your business is to get ahead of others, it will need to solve problems others haven’t solved and/or to solve them in ways others haven’t solved them before. So, it’s much better to hire someone eager to explore the unknown and learn and discover than to hire someone who knows existing answers to existing problems. Carol Dweck speaks to hiring for the Growth Mindset as part of her talk The Growth Mindset at Google. In, 5 Questions That Identify Growth-Minded Employees Jeff Boss also takes a stab at determining a growth mindset during the interview; it seems his questions could also be done by a coached recruiter during a phone screen. In How to Hire for Growth Mindset With One Interview Question Jessica Tower leverages the tell me about a failure question that I also like using. I’ll hopefully soon finish my post on interviewing to dive deeper on this. Why can one engineer be 10x more productive than another? Because they approach problems differently. Why does a 10x engineer approach problems so differently? Because they have a fundamentally different Mindset. Why is it that they have a different Mindset? Because they come from an environment that fosters a different perspective and experienced the rewards that this mindset brings. Why is this environment so different leading to such a different outcome? Because they have been influenced by parents, grandparents, uncles, aunts, teachers, mentors, role models, coaches, peers, and/or managers that help them recognize the values of not fearing failure, embracing challenges, seeking to understand the unknown, willing to take risks, be inspired by others, persist in the face of setbacks, be open-minded to trying novel approaches, learn from criticism, find lessons and inspiration from the successes of others and ultimately experience that this has helped them overcome challenges they may have previously seen as insurmountable. Why are these influencers so different from other people? Because they understand what has helped them succeed and are willing and able to invest in sharing these insights with others. ← Where to Begin the Journey?